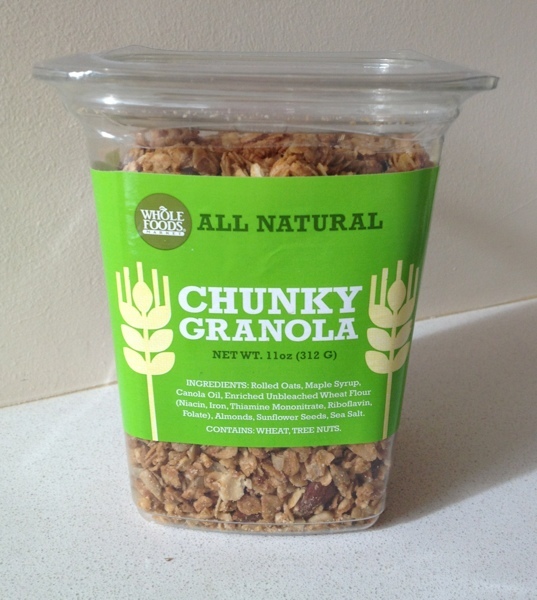 I love this granola from Whole Foods. 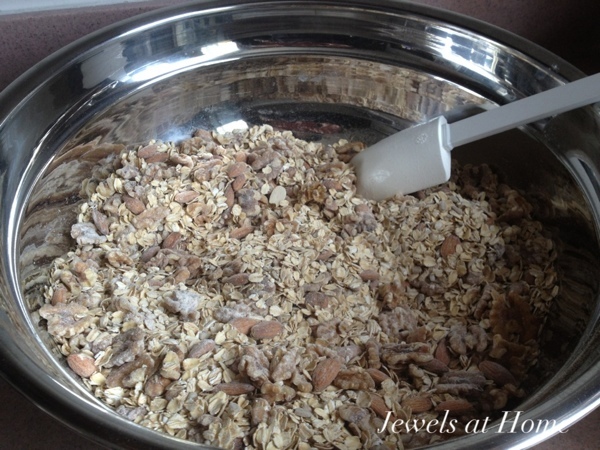 It’s very chunky and nutty and tastes delicious with yogurt and fruit or on its own. There are only a couple of problems with this love affair that have led me to try making our own version… 1) this little container costs $7 and we can go through it in a couple of days; and 2) the walnuts were my favorite part, and they’ve taken them out! Steve would probably add a third reason, which is that I used to steal all the walnuts out of the granola anyway (I also leave all the cashews in the mixed nuts, so he ends up with just cashews, but I digress…) In any case, I’m very happy to have figured out how easy it is to make this granola economically at home with extra walnuts to (theoretically) leave enough for everyone else. Here is the ingredient list. 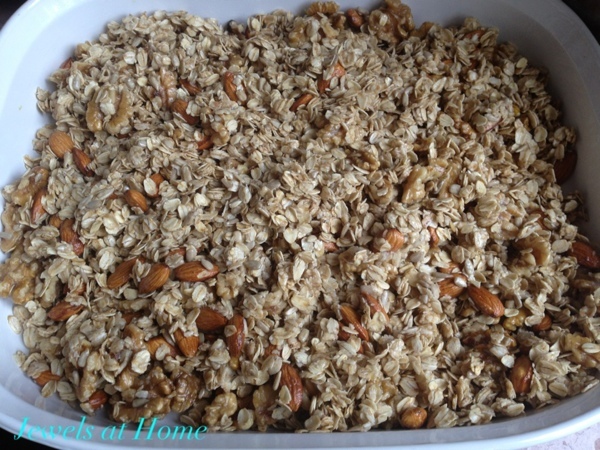 It was probably a bit ridiculous to try to recreate the granola from this list, since it has the basic ingredients of virtually every granola, but I thought I would give it a try. 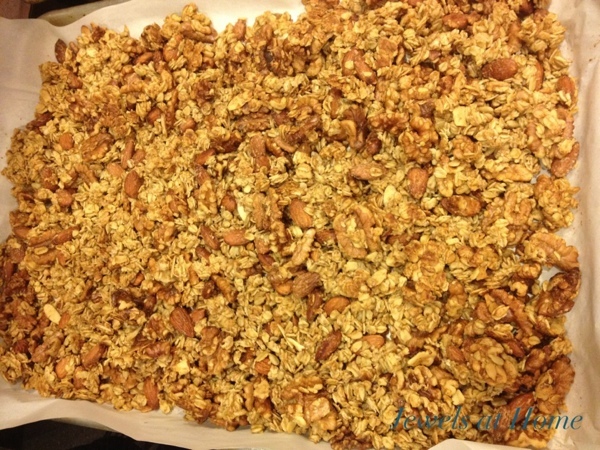 I don’t usually do a lot in the kitchen, but I was feeling inspired by the granola recipe from My Modern Asian Family, which I have tasted… and yum! 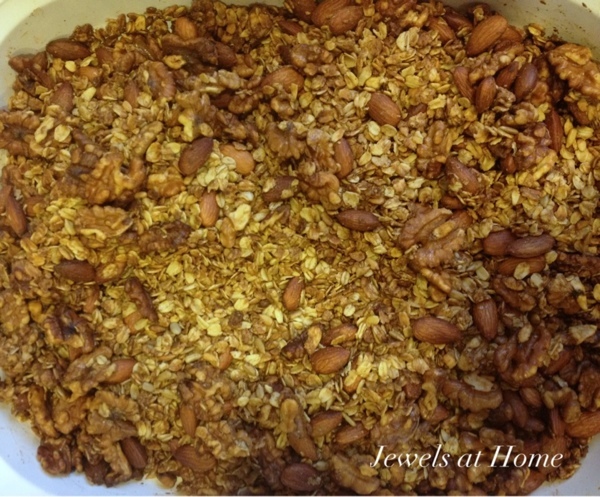 To get a starting point for the ingredient portions and technique, I looked at this chunky granola recipe from Thyme2Cook and played around with it. Here’s our current version, and I’m very happy with the results. I am finding the copycat recipe just as addictive as the inspiration, which may or may not be a good thing! Pour the liquid mixture over the dry ingredients and stir with a big spoon until all ingredients are thoroughly mixed and wet. Coat the dry ingredients with the wet mixture. Spread on a large lightly greased cookie sheet. Bake for 25 minutes at 325 F. Stir. 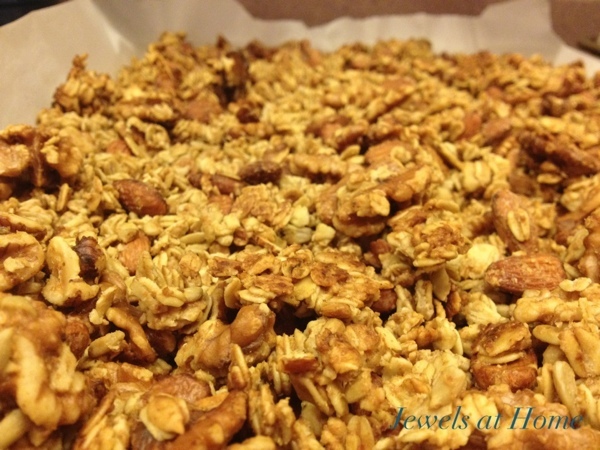 Bake another 25 minutes at 225 F. Turn off oven and leave granola in for one hour. Take it out, let cool, and store in an airtight container.